Levine states that recognizing each child's intellectual, emotional, and physical strengths--and teaching directly to these strengths--is key to sculpting "a mind at a time." A professor of pediatrics at the University of North Carolina Medical School, he eloquently substantiates his claim that developmental growth deserves the same monitoring as a child's physical growth. Tales of creative, clumsy, impulsive, nerdy, intuitive, loud-mouthed, and painfully shy kids help Levine define eight specific mind systems (attention, memory, language, spatial ordering, sequential ordering, motor, higher thinking, and social thinking). 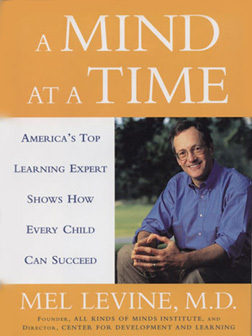 Levine also incorporates scientific research to show readers how the eight neuro-developmental systems evolve, interact, and contribute to a child's success in school. Detailed steps describe how mental processes (like problem solving) work for capable kids, and how they can be finessed to serve those who struggle. Clear, practical suggestions for fostering self-monitoring skills and building self-esteem add the most important elements to this essential--yet challenging--program for "raisin' brain." He provides chapters describing how each type of learning works and advises parents and teachers on how to help kids struggling in these areas. Levine emphasizes that all minds have some areas of giftedness and pleads for educators to "make a firm social and political commitment to neurodevelopmental pluralism."